Orchard Park, Windom, & Hillcrest responded on 4/27/17 at 1842 hrs for a report of a barn fire on E Quaker Rd. 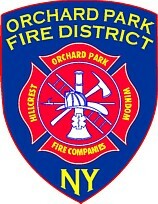 Orchard Park 9 & Orchard Park 10 went on location reporting a barn fully involved. Scranton, Woodlawn, Hamburg, Reserve (FAST), Eden (FAST), & South Line (FAST) responded as mutual aid to the scene. East Aurora was put on stand by in their hall, Armor filled in at Orchard Park, West Falls filled in at Hillcrest, & Big Tree filled in at Windom.